Most of my days are spent me in my super-loved pyjamas and a rather un-cool top bun. Although, taking care of two active kids under 5 is no doubt fulfilling in all aspects but it can be exhausting nonetheless, and most moms (like me) do forget about themselves amidst all the happy chaos of bringing up the little ones. So there are days when it feels great to dress up, slap on some bright lipstick, put on a strappy pair of heels and head out into the real world, sans kids and sans hubby (maybe???!!!). How much better if that could be done quickly with a limited but clean wardrobe. 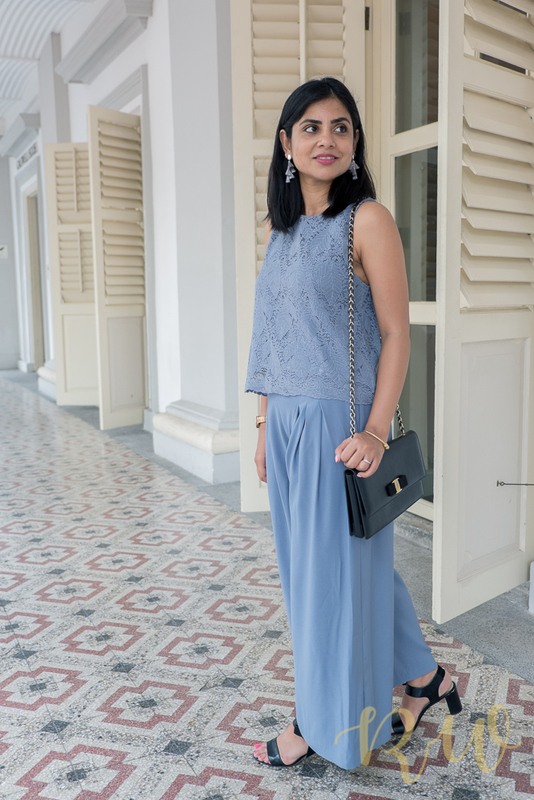 In this post I have created two outfit looks with the same pleated pants, one for the casual weekend outing and one for the more put-together evening look. 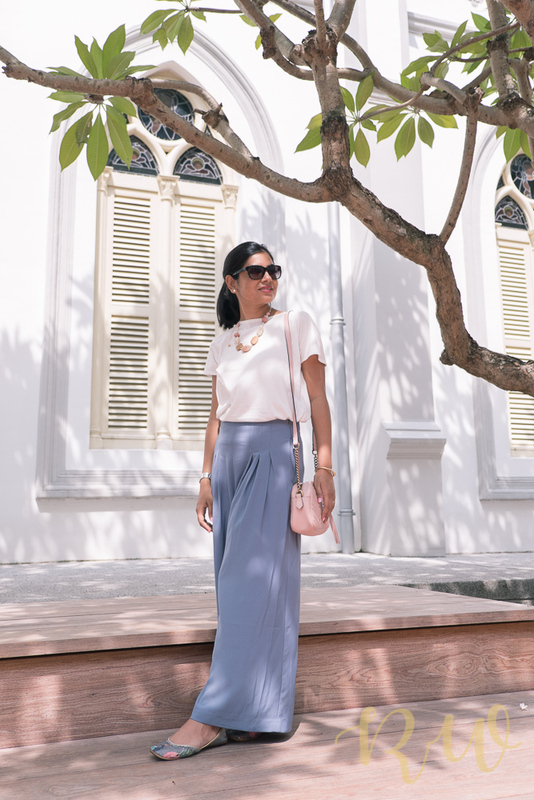 This steel blue pleated pants is my life right now….I can’t say enough how comfortable they are. The fall of the material is beautiful, it’s breezy and easy to wear (something I look for in all my clothes). For the day/brunch look, I paired it with a white tee from Muji. A versatile white tee in the wardrobe makes life a bit more easier, when it comes to deciding ‘what to wear’. I kept my accessories neutral and simple keeping the tropical weather in mind (Ohhh don’t get me started on the crazy summer weather now). My Fizzy Goblet ballet pumps (jootis) though, are the most complimented item in my wardrobe and I can’t get enough of them. This look is more for the evening night-outs, dinners and family get-togethers. 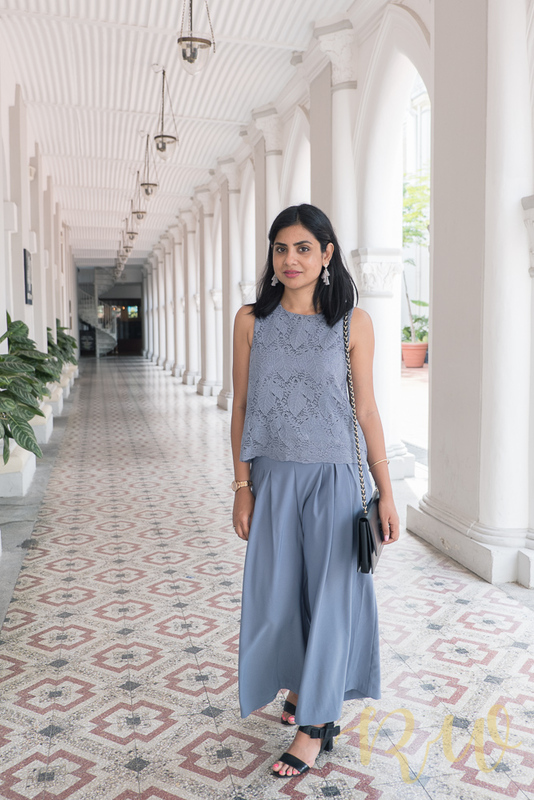 I wore the same pleated pants but this time with a lacy crop top of the same colour. Wearing same colour top and bottom gives the illusion of an elongated look. 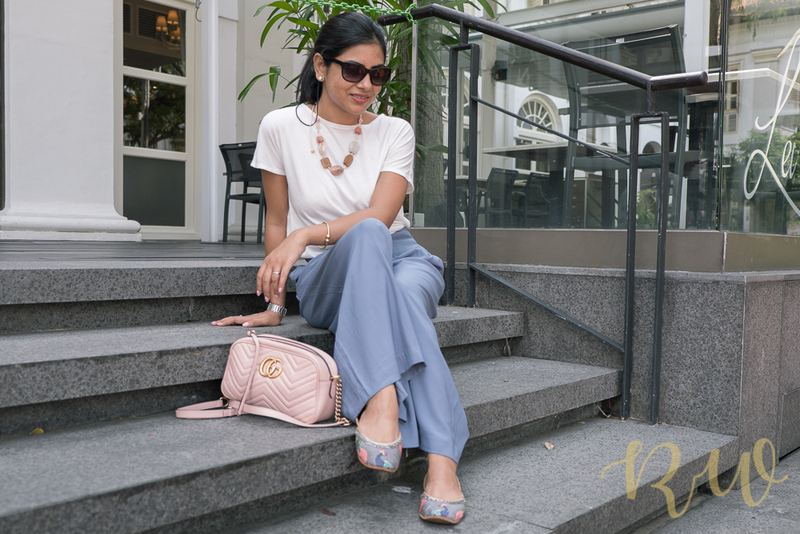 I accessorised the outfit with tassel earrings from Lovisa and a pair of strappy block heels from Charles and Keith. Putting on a colourful lipstick, some kohl, and adding a clutch make the outfit transition from day to evening super easy. Hope you enjoyed the looks as much as I have loved creating them. Do tell me which one is your favourite. Cheers to all the wonderful ladies in our lives and out there. Wishing you a fabulous Mother’s Day. Previous Post The Ones That Didn’t Work – for me! Both the combinations look great but I prefer the casual look more ….maybe the hot weather has something to do with it. Anyways you look gorgeous in both !